You’ve probably seen the car insurance TV commercials where the unfortunate victim of an automobile collision says their insurance company will only pay for “three quarters of their car” after it was destroyed in an accident. In our experience, it’s not a question of choosing the wrong insurance company – it’s failure to have the right coverage. We see this happening all too frequently. However, there are ways to protect you and your vehicle. When you finance a vehicle purchase, the bank or financial institution will require you to buy insurance to cover the loan in case the vehicle is destroyed or damaged in an accident. Comprehensive coverage requires the insurance carrier to pay for the value of your vehicle if it is stolen or damaged by fire, vandals or collision with an animal. Collision coverage requires the insurance company to pay for the cost of repairing your vehicle if damaged in a collision, or the total value of your vehicle if it is less than the cost of repairing it. What many people don’t realize is that the insurance company is only required to pay the fair market value of your vehicle in the event it is rendered a total loss in a collision or a fire. The fair market value of your vehicle, which can be determined by organizations such as the National Auto Dealers Association, can unfortunately sometimes be less than the amount you still owe the bank for the vehicle. This leaves you, the consumer, still owing the bank for the difference between the fair market value of your vehicle and the outstanding balance on your vehicle loan, even though the vehicle has been destroyed. Some carriers are now offering vehicle replacement insurance which theoretically provides sufficient funds for you to purchase a similar vehicle in the event your vehicle is rendered a total loss. However, most policies and most carriers do not provide this type of insurance, and you should ask your agent if this coverage is available. Be aware that you don’t have this type of coverage unless you pay for it as an additional part of your policy, but you can pay for this gap coverage when you finance your vehicle purchase. 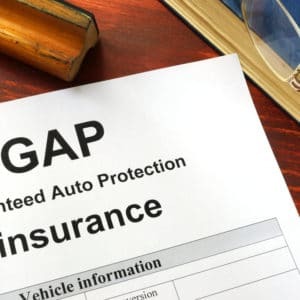 Gap insurance, as explained in an article on CarInsurance.com, covers the “gap” between the fair market value of your vehicle and the outstanding balance on your vehicle loan. In many circumstances, it might be a smart way for you to protect yourself from making payments on a vehicle after it is destroyed and you no longer own it. A new vehicle depreciates rapidly – immediately after you drive it off the car lot – by as much as 11 percent of its value, according to Trusted Choice Independent Insurance Agents. If you financed all or most of the purchase of the vehicle, the fair market value of your car is much less than what you owe the bank. To protect yourself after a vehicle is destroyed in a collision, purchase gap insurance and rest assured the entire bank loan will be paid off if your vehicle is a total loss. For more information, contact us at Abeyta Nelson Injury Law.